Verderflex peristaltic pumps are a comprehensive range of peristaltic hose pumps with hose diameters from 5mm (3/16") to 125mm (5"). These pumps reduce downtime, minimise maintenance costs and provide easy to operate and reliable solutions in difficult pumping environments. Specially designed hose construction to reduce fatigue, resulting in a longer hose service life. Simplified disaster proof hose connection for easy maintenance. The pumps can be supplied in either close-coupled or long-coupled (bore shaft)styles. System connections include DIN PN16, ANSI 150lb and JIS. Dry running, the Verderflex peristaltic pump is self priming and will run dry without damage to the pump. EHEDG certified hygienic connection options include TriClamp, RJT, ILC, IDF and DIN 11851, all with integral 316 Stainless Steel inserts. Can be supplied with accessories including pulsation dampers, dosing controllers, even as complete dosing or transfer stations. Clearly defined pump operation and cleaning protocols can be provided as part of the system design process. All pumps are supplied with a 2 year warranty covering any defects in workmanship and material under normal use. Abrasive and highly corrosive products - abrasion is not a limiting factor for the hose and no seals or rotating parts are in contact with the product. Shear sensitive applications - the very gentle pumping action does not damage the product. The medium to be pumped does not come into contact with any moving parts and is totally and hygienically contained within a robust, heavy duty hose. Highly viscous products - the positive displacement action enables high viscosity liquids to be pumped. Crystallising media - there are no valves or glands where crystals or product can build up and clog the pump. Dosing requirement - the absence of product slip in the hose gives a 100% volumetric efficiency. High maintenance situations - the hose is the only wearing part, and with a rapid changeover, downtime is minimal. Self-priming applications - the pump can run dry without damage to the hose. Products with high concentration of solids - 80% Inorganic solids can be pumped, e.g. in mining applications. 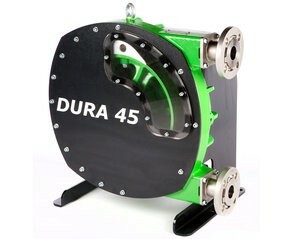 The pump can be reversed to unblock potential blockages in the suction line.